“Las Ramblas” is the main street in the city centre of Barcelona. 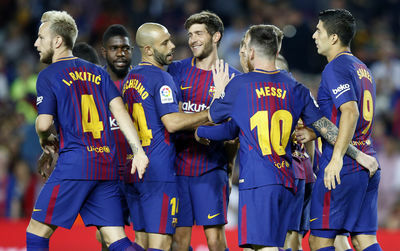 Staying at any of our recommended Las Ramblas hotels, the best known street in the Barcelona city centre showed in this page, will allow you to walk to any of the most important Barcelona sites for you Barcelona visit. 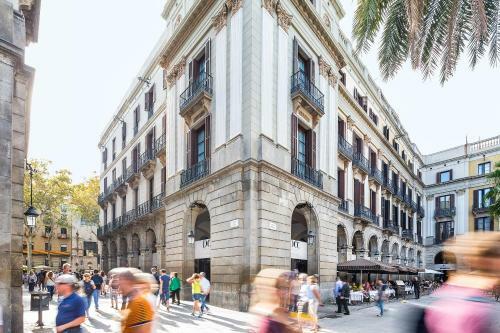 You will be able to visit the lower part, with the port and beaches, walk to the Cathedral and historical Barcelona Gothic quarter (Barri gotic), El Born, El Raval o la Barceloneta. 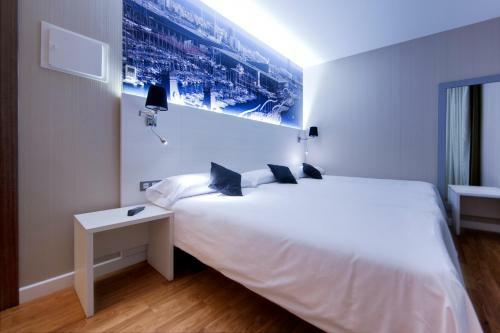 This is our choice of 4 star hotels on the Ramblas of Barcelona. 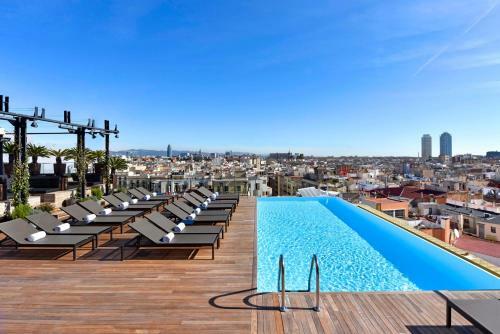 Any of these 4 star hotels will for sure make your Barcelona stay a real treat. There are other 4 stars on the Ramblas, but these are the ones we recommend. On the city centre (the Ramblas) Hotel 1898 is another of our favorite hotel in Barcelona. 1898 was known as the Palace of the Marquess of Comillas. From this glorious past it kept a rich historical atmosphere and harmony. We love its sunny terrace with pool, large rooms, a restaurant by chef Carles Boronat, a beautiful spa. No hesitation..
On a lower budget, we also want to recommend some 3 star hotels, also located on the Ramblas. 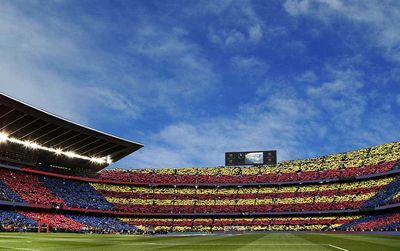 We are confident your stay in Barcelona will be a great success with this selection. 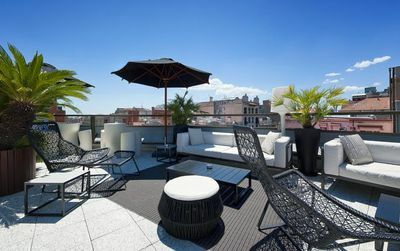 Just a hundred meters from the Ramblas, the H10 Raco del Pi is beautifully situated in the Gothic Quarter of Barcelona. The Atrium, which glass has been just renovated, it is the heart of this 37 room hotel. We also retain the freshness and comfortable rooms, great breakfast buffet, free wifi everywhere and unanimously: the kindness of his personnel. 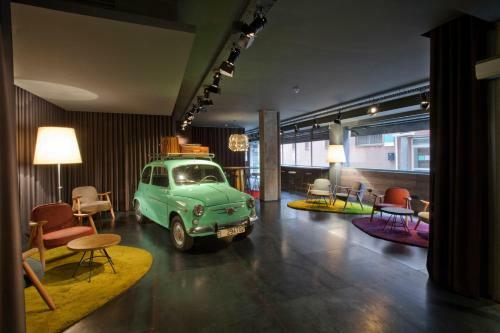 This time the hotel chain Chic & Basic, which we greatly appreciate, has created a vintage atmosphere from the 60s and is located just off the Ramblas. With a young and colorful decoration with a big sense of humor, and above all thought to be pleasant with nice rooms, air conditioned and quiet. We love the bicycle hire, free wifi and private parking .. 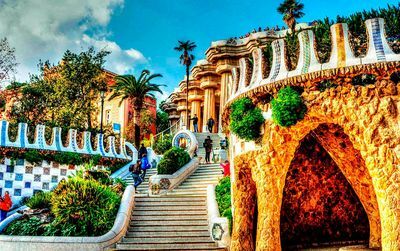 If you are on a basic budget, you will appreciate the following recommendations of hostels on the Ramblas. Again, we believe these are the best choices among a large offer that always makes it difficult to choose. 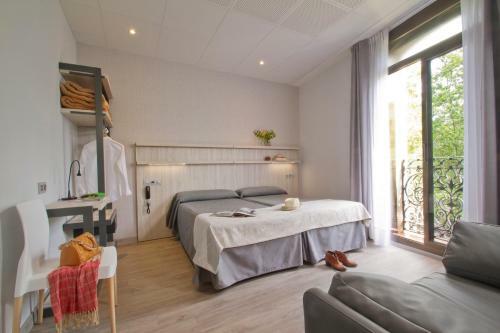 A perfect guest house of 11 rooms just opposite the famous market Boqueria. You are in the centre of the city, just next major’s attractions. Hostal BCN Ramblas strikes especially by the quality of its recent decoration: roomy rooms, fresh and useful. 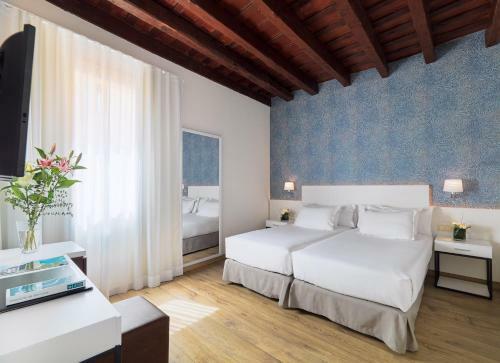 Knowing that you will find private bathrooms, wifi, TV and 24/24 reception, you should not hesitate too long! The Hostal Benidorm is located on the Ramblas. 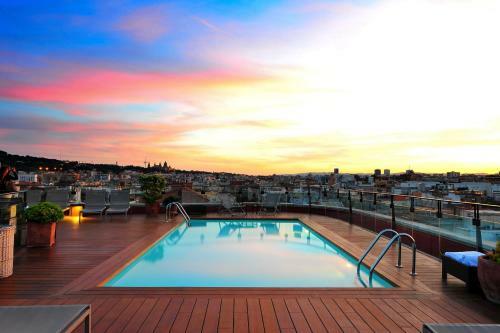 Hard to be more in the city centre area, only two steps away from all attractions and places to visit in Barcelona. The rooms are rather roomy, luminous and irreproachably clean. Wifi, TV, privative bathroom, vending machines and 24/24 reception. Very a good choice in this range of price. loved this city, one of the best stay for years. don't really like the ramblas but certainly the best place to stay for being really close to best places to visit. Good selection of hotels. I would choose this area if I would return to Barcelona. Being in the ramblas area is just the only things to do as every places and monuments are around. Good selection. Beware of crowd.